The First Matabele War was the first wartime use of a Maxim gun by Britain and it proved to have a decisive impact. In less than optimal situations, such as hilly or mountainous terrain or dense vegetation with poor lines of sight, the Maxim gun resulted in little direct impact on enemy deaths. But as a psychological weapon, the Maxim gun was truly phenomenal. It generated a sense of fear in the Matabele and made the British South Africa Police seem invincible. In one engagement, for example, 50 company soldiers with just four Maxim guns fought off 5,000 Matabele warriors. Although the crew are based on the British South Africa Company, they are dressed in robust Victorian outdoors gear and therefore could be used for Irregular forces in many different theatres. 28mm sized model. 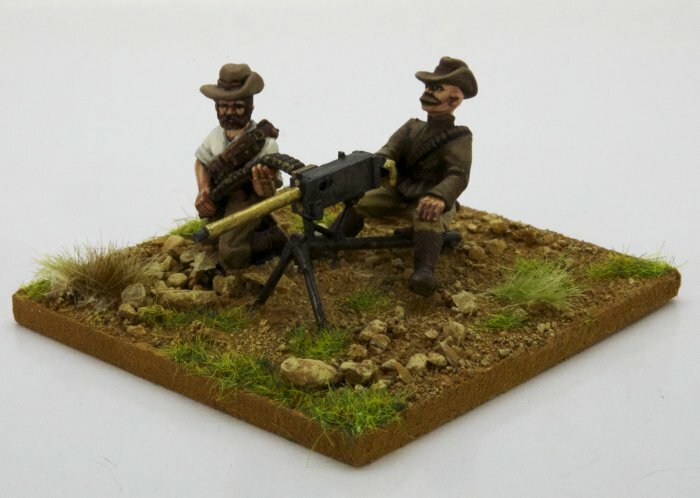 The Maxim gun is a metal kit that is supplied unpainted and requires assembly. The crew are metal figures supplied unpainted.